The Coopered Tot: Chivas Regal 12 versus Johnnie Walker Black - head to head. 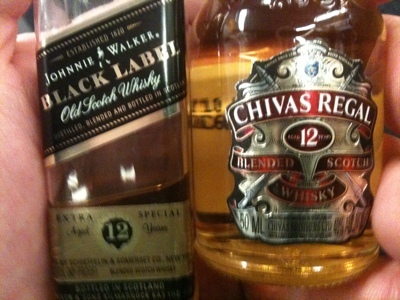 Chivas Regal 12 versus Johnnie Walker Black - head to head. How many times have you ended up in a bar or a house or an airline seat where your choice in scotch comes down to "Johnnie Walker Black or Chivas Regal 12"? These are the two leaders in the "premium mainstream blended scotch whiskey" space. The choice could be much worse. There are many lesser blends loaded with grain alcohol that don't sip like real scotch like these two do. I won't name names (but some are called Dewars, Cutty Sark, J&B, Passport, Grants, and some name preceded by the word "Clan"). Anyway this essential choice has happened to me plenty. For a long time I habitually went with Chivas for no particular reason. I guess I thought all that gold foil and heraldry on the label looked more posh. Tonight (after a whole day for my palate to return) I'll be putting Chivas Regal 12 head to head against Johnnie Walker Black with 50ml miniatures sourced from a an airline beverage cart. Nose: Muted and gentle - but possessing appetizing and pleasing notes of cake batter, toffee, some heather and distant sherry. Entry is light and sweet with true scotch tastes of honeyed malt. There is moderate spirit heat at midpalate but some good cereal malt backbone and structure. There is the brief suggestion of some red fruits at midpalate too - but only for a moment. At the turn to the finish you can taste some oak and some vanilla floral oak notes. The finish is moderately short but nice and sweet with lingering burnt sugar and gentle distant oak. Noticeably absent is the sour dairy/ vinyl / undercooked onion notes of too much Coffey still grain alcohol. The blenders at Chivas have made a nice amiable, very smooth, simulacrum of an idealized composite Speyside or Highland malt. Johnnie Walker Black Label 12 40% abv. Color: a darker shade of pale gold than Chivas with a richer and more glittering appearance. Granted this darker color may be the result of added caramel color. Nose: gentle and smooth, but more assertively rich with toffee, vanilla, some sherry notes, grain sugars, some floral and wood notes and a little hint of mint. Not a huge nose, but more assertive and involving than Chivas' to a small degree. Entry is sweet and creamy with malt, honey, heather, and sweet cream. There is a thicker mouthfeel than Chivas. Midpalate brings a gentle spirit heat but also a solid cereal grain note and bit of peat smoke. The transition to the finish brings in oak vanilla notes and a sense of the wood. The finish is moderately short too, but with a real sense of wood character. There's more structure and duration to the finish of JW Black - just as there was more up front and in the middle. Drinking both side by side, Chivas feels a little lighter and thinner with a bit more spirit heat. Somehow, after a sip of Johnnie Walker Black - when I take a sip of Chivas I can clearly detect the slight fishy texture, heat, and trace of the flavor of grain alcohol that I didn't notice when drinking Chivas on it's own first. Johnnie Walker Black is the clear hands down winner of the face off. Chivas comes off as a light, drinkable blend. Johnnie Walker Black comes off as almost a full malt by comparison. To be fair, Chivas 12 goes for around $30 a 750ml bottle around here and Johnnie Walker black goes $34 - a premium of over 10%. However, there is no doubt in my mind that JWB justifies the modest premium. Johnnie Walker Black and Johnny Walker Red review compared head to head. Great King St. Artists Blend is a solid effort. Is it a Johnnie Walker Black and Chivas killer? You inspired me to try my sample of JWBL (though to be honest, I was planning on doing it sometime this month). Interesting how our notes are different, yet I think I see how you got your's. I think I am officially a malt-snob now, though, since JWBL doesn't do it for me like it used to! Ha! The airline stewardess isn't offering you a choice between Highland Park 18 and JWBL. JWBL shines in comparison with Chivas. Less so against comparably priced single malts. In my earlier JWBL/JWRL face off I declared that JWBL Is a fine choice if you're looking for a sweet and simple flavor profile but isn't a compelling value compared to most (but not all) the single malts in the $30-$40 price range. A big part of why I'm reviewing JWBL is because you spoke so highly of it on your blog, I hadn't had it in almost 20 years. I was too much of a snob to try it again. You're right in that description of it: "a fine choice but poor value compared to malts." Well, at least we both learned something by revisiting it. Sorry if my original post gave you false hope. That's part of the reason I bought another miniature of it; I wrote the post based on my initial pre-malt enthusiasm, but I clearly remember by the end of the bottle being a bit more disappointed. Actually, I thought my end-of-bottle disappointment was from the JWBL degrading over a couple months, but now, I think maybe my palate just evolved to love malts. Still, it wasn't a bad dram to have. I would revisit it occasionally if I can get it for cheap. Not the great deal I once thought it was, though. No issue of false hope. I think I've found a friend in JWBL. It's a decent option that tastes good and doesn't do anything wrong. It might not be exciting in any particular dimension, neither is a nice old worn comfy sweater. JWBL is available in a lot of circumstances good single malts aren't. Now I know that JWBL satisfies me it saves me from accidentally ordering something else that doesn't (like most of the other mass market scotch blends - excluding White Horse, Teacher's, and Grouse 12 - but all of those aren't as commonly seen at weddings and funerals or airline carts as JWBL). Exactly, why I drink Chivas. Not necessarily less hangover, but is smoother than JWL. Since I haven't drank JWL for a long time I tried it when my brother in law gave a JW double black shot. I was surprised how smooth it was, and now I feel I can easily go either way. As a full disclosure, I am not connoisseur of malt whiskey; I can only handle the good stuff when it comes to hard spirits. The Difference is in the after effects. Full hangover aftereffects with Johnnie. With Chivas, you get up normal. No headache, no upset stomach, no fatigue feelings. Chivas wins hands down. I used to be a Johnnie man. NOw I wont even touch the stuff. I try very hard not to drink so much that I experience "hangover aftereffects" with any whisky (not that I always succeed in that attempt). However, I have trouble believing that either of these blended Scotches would provoke a hangover more or less than the other. Hangovers are causes by alcohol's effects on the body (and to a lesser extent by the tannins and other compounds in the drink). Chivas 12 and JWBL are very similar in composition chemically - being mostly grain whisky and malt whisky with light to moderate oak influence. In my opinion you are either splitting hairs or confusing a particular experience with a general phenomenon. Not that the latter is unreasonable. I got sick on Bourbon in College and it was a long time before I could tolerate even the smell of it again. That's completely natural behavioral conditioning: your brain's conditioned reflex to protect you. JWB is well rounded. This is something that Chvias Regal can't do to my taste buds. You don't get that well rounded experience until you buy a Chivas Regal 18+ year. JWB is certainly well rounded. And I agree that Chivas Regal 18 is a totally different experience. Chivas 18 is well balanced and has some lovely flavors. But at $75-$85 it's expensive for what you get. There a number of single malts I prefer for that level of money (Aberlour A'Bunadh, Talisker 10 etc...) but there's a rounded softness that's very appealing to the higher end blends - that is true. It's been a while since I've tried Chivas. JWB was actually the first scotch whisky I tried, and remember the smokiness being a bit off-putting at first (it's a different beast altogether from bourbon). I found Chivas more to my liking. Since then, I've tried a number of Speyside and Highland malts, and wonder if I'd have a new appreciation for it, or find it bland in comparison.